Home » Brain Function » Depression » Can Niacin Help Treat Depression? Approximately 19 million Americans are estimated to be affected by depression every year. Throughout the years, a countless number of studies have gone into what we eat or what supplements might play a role in combating depression. Niacin is typically touted as a way to improve heart health. It can lower overall cholesterol and triglycerides while boosting HDL plasma levels. But did you know that niacin is also responsible for brain health and can help treat depressive symptoms? Since the early 1950s, high dosages of niacin have proven to be an effective treatment for depression, schizophrenia, and other mental disorders. It’s amazing that this B vitamin isn’t more recognized for its impressive benefits! The correct level of Niacin dosages needed to treat schizophrenia and depression are far higher than what you would typically get from your diet or even in a supplement bottle. Effective dosages are anywhere between 1,500–5,000 mg per day, which causes some medical practitioners to be concerned. Can High Dosages of Vitamins Be Dangerous? There are a lot of mixed feelings about taking too much of a given vitamin or mineral. For the most part, toxic levels of most vitamins and minerals are extremely high and are almost unreachable by most. Because niacin is a fat-soluble vitamin, your body does not store it; therefore, you need to take it every day.Furthermore, if your depression symptoms are caused by a niacin deficiency, you’ll need more than the average person. Treatments in the 5,000 mg-per-day range have shown to offer therapeutic benefits without any side effects (perhaps other than some flushing for the first week or so of treatment) in most. Since the early 1950s, niacin has been studied—and produced exceptional results—for curing schizophrenia and depression. In 1954, a psychologist named Dr. Hoffer began treating institutionalized schizophrenic patients with niacin-fortified flour. Within a few weeks, half of the subjects experienced significantly positive changes concerning their schizophrenic symptoms and were released from the facility–in other words, they were cured. Dr. Hoffer then focused on the people who continued to experience schizophrenic symptoms. He decided to increase their dosages of niacin to 3,000 mg per day, and guess what happened; the majority of those subjects were cured, too. Eighty percent of them ended up being released. For whatever reason, these double-blind placebo tests were largely quieted by the American Psychological Association and Dr. Hoffer was blacklisted. This is not uncommon in the medical community when new ideas are put forth. It often takes time—sometimes decades—for new, fact-based research to be accepted by the masses. There are a number of reasons for this and are well beyond the scope of this article. Food alone won’t cover the correct therapeutic dosages of niacin needed to assist with depression, but a diet rich in niacin can provide other health benefits, like lower cholesterol and improved heart health. If you can’t kick your depressive symptoms, it might be possible that you don’t have a mental disorder at all, but rather a niacin deficiency. And because the standard American diet isn’t the most nutritious in the world, you likely won’t be able to get a therapeutic dose from diet or a multivitamin supplement alone, so buying niacin (vitamin B3) supplements is recommended. If you’re currently on antidepressants or not taking medication at all, it’s wise to talk to your doctor before you start taking niacin in a high dosage. There could be interactions you should know about, and your doctor should be aware of any new health or treatment changes you’re considering. After all, if your doctor isn’t aware of your treatments, it can make it much harder to provide safe and quality care. Mercola, J., “Could Chronic Niacin Deficiency Be a Root Cause of Increase in “Deranged” Violent crimes?” Mercola.com, October 21, 2012; http://articles.mercola.com/sites/articles/archive/2012/10/21/pellagra-causes-violent-crimes.aspx. 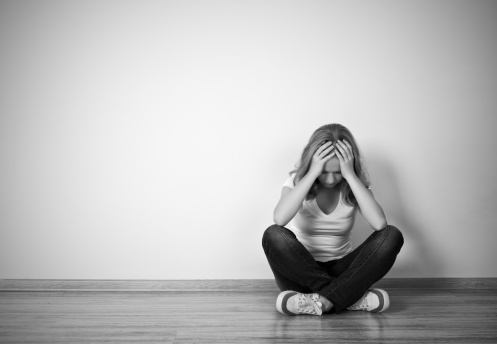 “What is Depression?” AllAboutDepression.com, http://www.allaboutdepression.com/gen_01.html; last accessed June 12, 2015.